Reuues & corrigees par ladite dame. A Lion: Par Ian de Tournes, 1556. Nicknamed “La belle cordière” (The beautiful ropemaker), Louise Labé was the daughter and wife of ropemakers in the city of Lyon. She received an extensive education in the classics and Italian humanism, unusual for women in her day. 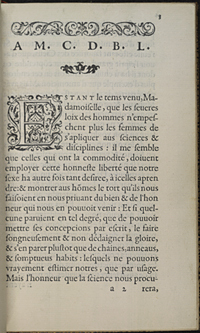 In 1555, the noted Lyon printer, Jean de Tournes, published the first edition of her Oeuvres. The Gordon Collection copy is from an edition published by the same printer one year later, “Reuues & corrigees par ladite dame.” This book’s title page is a wonderful example of the elegant typographical elements employed by Jean de Tournes, from the ornate arabesque border to the refined roman and italic typefaces. In her dedicatory epistle to a friend, Clémence de Bourges, Louise Labé exhorts women to raise their gazes above their spindles and distaffs, to pursue and value knowledge and its rewards rather than jewelry and expensive clothes, and to pick up their pens to put their thoughts in writing (“mettons par escrit nos conceptions”). The Debat de la folie et de l’amour opens with a quarrel between Love and Folly, who have both arrived at the palace gates for a feast of the Gods, convened by Jupiter. In the struggle over who will enter first, Folly blinds (and blindfolds) Love. Jupiter calls on Apollo and Mercury to debate the merits of each party in the conflict. Apollo presents Love’s defense, Mercury defends Folly, and their prose speeches represent most of the work. In the end, Jupiter defers his judgement of the difficult case for many centuries, and declares that Love and Folly will have to get along together. Labé transforms the medieval forms of debate and allegory to present a learned, yet lively and light-hearted treatment of two popular Renaissance topics, the defense of love and the praise of folly. 24 love sonnets (the first one in Italian) follow three verse elegies on the effects of passionate love. Modern readers of Louise Labé know her best for the sonnets, inspired by Petrarchan tradition and successfully evoking intense feelings of passion and of the suffering caused by love not returned. Her use of Petrarchan elements (the lute motif, the themes of night, solitude, death, and the distance separating lover and beloved, for example), as well her particular use of sonnet structure and rhetorical forms, combine to convey the tumultuous effects of love through the suffering voice of the lyric “I”. Louise Labé was a key figure in the group of poets writing in mid-century Lyon, later referred to as the “Ecole de Lyon,” and including Maurice Scève, Pernette du Guillet and Pontus de Tyard. Their adoption of Italian models and poetic structures, their erudition (all were well-versed in the classics and Italian), and their judicious use of classical mythology combine to create a new style of French poetry, distinctly different from the works of the earlier Rhétoriqueurs and Marot, that raised the status of love poetry and of poets in France, and paved the way for the poets of the Pléïade. Labé, Louise. Oeuvres complète: sonnets, élégies, débat de folie et d'amour, poésies. Ed. François Rigolot. Paris: Flammarion, 1986. Bourbon, Anne-Marie. 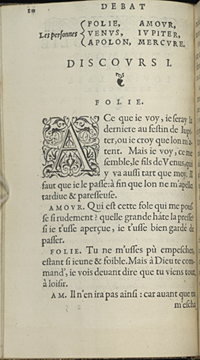 Debate of Folly and Love: A New English Translation with the Original French Text. (History & Language. 8.) New York, NY: Peter Lang, 2000. Baker, Deborah Lesko. The subject of desire : Petrarchan poetics and the female voice in Louise Labé. Foreword by Tom Conley. West Lafayette, Ind. :Purdue University Press, 1996. Rigolot, François. 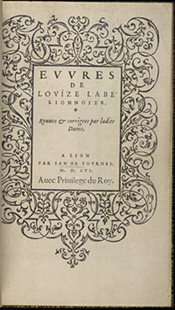 Louise Labé Lionnaise, ou, la Renaissance au féminin. Paris: Champion, 1997. Sonnets de Louise Labé (site de l'Académie de Lyon). 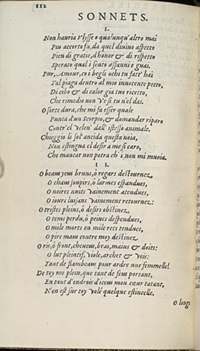 The site provides black and white images of the sonnets, a transcription of the originals, and the translation into modern French. There are also bibliographies for studies of Louise Labé and related topics, a timeline of her life, and a transcription of her 1565 testament.